"What a country chooses to save is what a country chooses to say about itself." 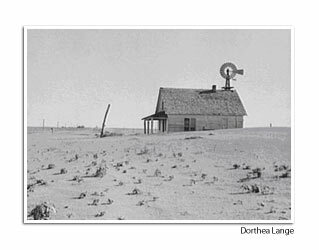 From 1933 to 1940 the southern and central Great Plains region of the United States suffered through a severe and sustained drought known as the Dust Bowl. Crops failed and fields were left unprotected from the unrelenting winds common to the region. Soil eroded and was blown away, creating massive black dust storms that affected areas as far away as New York. The storms blotted out the sun and contributed to extremely harsh living conditions. In 1935, Congress unanimously passed the Soil Conservation Act declaring soil and water conservation a national policy and priority. The Soil Conservation Service (SCS), now the Natural Resources Conservation Service (NRCS), was created under the act to develop and implement soil erosion control programs. President Franklin Roosevelt recognized that local leadership was needed to help coordinate the efforts of the new federal agency and tie it into local conditions and priorities. As a result, he wrote the governors of all the states in 1937, recommending legislation that would allow local landowners to form soil conservation districts. Today, nearly 3000 conservation districts operate in the United States to help develop locally driven solutions to natural resource concerns. Forty-eight of those districts are found in Washington State. Districts are represented by the National Association of Conservation Districts (NACD) and the Washington Association of Conservation Districts at the national and state level, respectively. The Washington State Legislature passed RCW 89.08 in 1939, enabling the establishment of conservation districts in the state. In 1948, the Wenatchee-Entiat Soil Conservation District and the Lake Chelan Soil Conservation District were created. The two Districts merged in October 1973 to form the Chelan County Conservation District. In July 2007, we changed our name to the Cascadia Conservation District to prevent confusion with county government and to better meet the needs of our district members and stakeholders. We are a non-regulatory political subdivision of the State of Washington. Our district includes all of Chelan County. Our mission is to encourage wise stewardship and conservation of all natural resources for current and future residents of Chelan County. We work toward cooperative solutions that result in the greatest benefit for the greatest number of people. Follow the links to the right to meet our Board & Staff members, federal partner, and supporting organizations.